As explained in the article "What is Canon? ", only information directly taken from the episodes or movies can be canonical. However, in fandom, and even in official publications, a number of notions are commonly regarded as canon facts although there is little to no support for them. Reasons for such false canon are that fans constantly attempt to rationalize problems or to fill gaps in biographies or specifications. 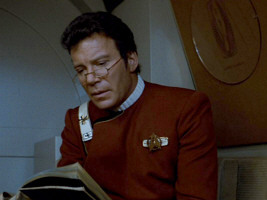 In some other cases, misconceptions and over-interpretations of canon facts have been perpetuated, sometimes unwittingly in reference books or on the official website startrek.com. Note Many more examples may be added if we take into account a number of ship class names, registries or other secondary evidence that were likely made up behind the scenes, by Gene Roddenberry (Yorktown was renamed to Enterprise NCC-1701-A), by Greg Jein (Constitution registries) or by the Okudas (registry of the USS Antares) without ever appearing on screen. But seeing that much of this information is required in order to be able to call designs by their names, such little facts are accepted as apocryphal canon here at EAS. And eventually the NCC-501 of the USS Antares even made the transition from apocryphal to full canon when it appeared in TOS-R: "Charlie X". "Australia was the last country to join the United Earth Government in 2150." This statement is downright wrong. In TNG: "Attached" Dr. Crusher just picked Australia as a hypothetical example of a country not becoming a member until 2150. Beverly actually said, "What if one nation, let's say Australia, had not joined...?" "Spock was the first Vulcan in Starfleet." This is a widespread statement in official publications as well as in fandom, but it was never stated in any TOS episode or movie. Actually, the idea may have originated as behind-the-scenes information, as Spock was supposed to be an exceptional person in any conceivable respect. In TOS: "Journey to Babel" Amanada and Sarek have an argument about Spock's decision to join Starfleet. Sarek didn't approve of it because in his view it is not the Vulcan way. So while it may be unusual for Vulcans to enter the obviously human-dominated Starfleet, there is no indication Spock was the first one. The idea is dubious anyway in light of the Intrepid (TOS: "The Immunity Syndrome"), a Starfleet ship with an all-Vulcan crew which we wouldn't expect less than two decades after Spock was the first Vulcan to attend Starfleet Academy. Clearly Spock's presence on the Enterprise NCC-1701 is no obstacle for T'Pol to become the true first Vulcan Starfleet officer a hundred years earlier (albeit of Earth Starfleet). "Women were not allowed to become starship captains in the 2260s." "Your world of starship captains doesn't admit women", Janice Lester's complaint from TOS: "Turnabout Intruder", seems to be corroborated by the lack of female captains at that time. But it is just an awkward interpretation that there used to be a regulation of Starfleet generally not to admit female captains. First off, Lester is a nutball so her statement is suspect from the start. Secondly, she could have meant that life as a starship Captain is not conducive to having long-term relationships with women, which would seem to be supported for the most part in Trek with a few notable exceptions. Thirdly, the statement just does not fit with the stated beliefs and goals of Star Trek and Roddenberry and is quite honestly offensive if that is the way it was meant, so it is best forgotten. With the female captain of NX-02 (ENT: "Home") the myth has been refuted anyway. "Starfleet has a department called the 'Starfleet Marines'." Starfleet Marines are exceedingly popular, and no online RPG could possibly exist without them. There is some scarce evidence for a distinct department that may encompass ground troops: the rank of colonel (namely Colonel West) in the extended version of "Star Trek: The Undiscovered Country" and personnel with previously unseen uniforms in DS9: "Nor the Battle to the Strong" and "The Siege of AR-558". However, there is neither a mention of a distinct part of Starfleet's military organization, much less particularly of "Marines". The word "Marines" has been used behind the scenes though (by uniform designer Nilo Rodis, as mentioned in The Making of the Final Frontier). The special forces on Enterprise NX-01 are called "MACOs", not "Marines" (where MACO is not supposed to stand for "MArine COrps" but for "Military Assault Command Operations"). "Alpha Centauri is an alien world and a founding member of the Federation." Until ENT: "Twilight" when it was ultimately confirmed that Alpha Centauri is a human colony, the star system was mentioned only once or twice altogether and never as an alien world or a founding member of the UFP. Well, Alpha Centauri is said to be a founding member in Picard's scrapbook in "Generations", but this was far from being readable in the movie. "Zefram Cochrane was a native of Alpha Centauri." It is odd how some fans uphold this stance based on a single line from TOS: "Metamorphosis", although Cochrane is identified as human in the TOS episode and "Star Trek: First Contact" makes it clear beyond the slightest doubt that Cochrane (whose first and last name are of human origin, by the way) is a human being who has never seen any aliens. He may have moved to Alpha Centauri at a later date, but as of 2063 he has never left the planet. The myth probably came into existence in the (non-canon) book Spaceflight Chronology, where an Earth ship arrives at Alpha Centauri and made first contact with Zefram Cochrane. "Federation Standard is the universal language written and spoken in the Federation and differs from English." 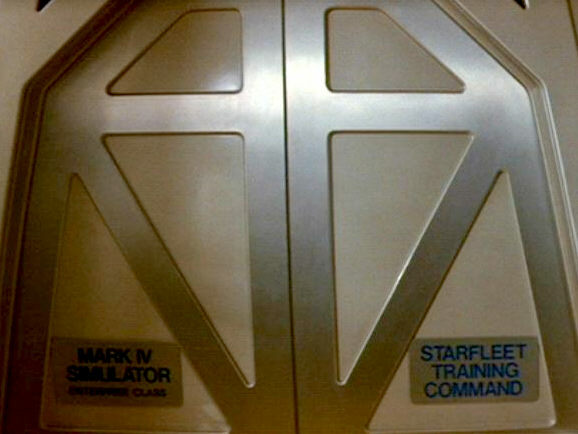 Federation Standard never appeared in canon Star Trek until 2019 (except perhaps on some display at an illegible size). It was only mentioned in many licensed novels and in fan fiction. The underlying idea of "Federation Standard" is that the United Federation of Planets has settled on a common language that is more inclusive than English. Considering that Federation citizens in the series and movies always speak and write English (unless they use their native languages, such as Vulcan), the rationale is that the TV "translates" it from Federation Standard to English for the viewers (in the same fashion as it is often done with Klingon, at least in its spoken form). But even when naming their own written or spoken language, the crews of Starfleet ships always (without a single exception) say it is English, on dozens of occasions. This invalidates the idea of Federation Standard as a language that is actually commonly spoken, while we can't exclude that it is a formal language, a lingua franca (like Latin in Europe some 1000 years ago) or some sort of abstract model of a language that can be created and understood with the help of the universal translator. With all the above in mind, DIS: "New Eden" makes a big mistake by referring to the language of the people on Terralysium as "Federation Standard". As already mentioned, there is overwhelming evidence that English is spoken on Starfleet ships from the 22nd to the 24th century. The only way for the statement to be true is that Federation Standard equals English (or is at least close enough not to notice the difference after listening to a few sentences), as a sort of politically correct term without a real significance. If this is the case, however, why would anyone refer to the language of people that came from Earth and have been isolated on the planet for 200 years as "Federation Standard" and not as English? As if they forget that they speak English themselves? The existence of "Federation Standard" makes no sense - neither as a replacement for, or supplement to, English as in the novels, nor as a synonym for English as in "New Eden". With all the available evidence it is safe to say that, if anything, it is a redundant and additionally rather uncommon alternative name for "English". "Earth fought and eventually won a series of wars against the Kzinti in the 21st century." The Kzinti only appeared in TAS: "The Slaver Weapon", an episode written by Larry Niven as a cross-over with his Known Space series. First of all, this certainly doesn't imply that anything from the Known Space novels with their totally incompatible timeline is canon in the Star Trek Universe. Secondly, we have to keep in mind that the popularity of the Kzinti in fan fiction has no bearing on the question. Thirdly, the canon status of TAS is debatable anyway. But if we presuppose that TAS is or can be canon, what can we make of Sulu's statement about the Kzinti Wars that ended "200 years ago"? Well, the wars would have taken place in a time when Earth was in no shape to fight an interstellar war, much less win it. Moreover, the wars ought to have been mentioned on many occasions. There is no way that the Kzinti Wars can be canon, unless we ignore or re-interpret facts and statements from several live-action episodes that depict a wholly different 21st century. There are ways for the Kzinti to exist in canon Trek, but not with the historical background of "The Slaver Weapon". "The Romulan War, during which Earth received support from Andor and Tellar, led to the founding of the Federation." Clearly the two events took place at about the same time, as was ultimately confirmed in the final season of Star Trek Enterprise, so the statement would absolutely make sense. But there is no evidence that the foundation of the Federation is a direct consequence of the war. We do not know either whether Earth really received support from two other founding members (the fourth being the Vulcans who were neutral as we can easily imagine). "The Vulcan home system is Epsilon Eridani." The canon central star of Vulcan is 40 Eridani A, not Epsilon Eridani. 40 Eridani was once proposed by astrophysicists to Gene Roddenberry, who liked the idea. With the distance from Earth to Vulcan mentioned in ENT: "Home" being 16 light years, the distance of 40 Eridani A, we now have the missing canon confirmation. Alas, when a Jupiter-like gas planet was found in orbit of the star Epsilon Eridani, this planet was nicknamed in the media as "Vulcan", based on the false canon information on Epsilon Eridani being Vulcan's central star. In 2018, a planet was found in orbit of 40 Eridani A as well and once again (and this time correctly) nicknamed "Vulcan". 61 Cygni "swan" emblem in "Star Trek II"
"Epsilon Indi is the Andorian homeworld, 61 Cygni is the Tellarite homeworld." Neither can be in any way confirmed. Actually, both star systems Epsilon Indi and 61 Cygni are only mentioned in the Star Trek Technical Manual by Franz Joseph, along with depictions of their seals and flags. The 61 Cygni even has the depiction of a swan (Greek: cygnus), which is surefire evidence it doesn't belong to an alien civilization. Anything relating them to Andor or Tellar, respectively, is missing in this context, even if the book were relevant with regard to canon. At least four of the seals from the book, including 61 Cygni (but not Epsilon Indi; the other three are the UFP emblem, the UFP pennant and the Alpha Centauri pennant), appear in the travel pod in "Star Trek II". But once again, the swan emblem is not related to the Tellarites. "The Romulans call themselves Rihannsu." This idea is fanon of a quite consistent kind. The name "Rihannsu" was never spoken out on screen and is therefore non-canon. But it appeared in the novels of the Rihannsu Book series (the first being My Enemy, My Ally) and in Spock's World, all by Diane Duane, which explains why it has become quite popular. "The Cardassians were unknown to the Federation prior to the 24th century. The mention of Cardassians in Enterprise and in 'Star Trek (2009)' is an error." There is nothing in canon Trek to support this notion, other than a lack of Cardassians in TOS and the TOS movies. The obvious real-world reason is that the Cardassians were created for TNG: "The Wounded" and are mentioned in prequels. "Archer's threat at the end of ENT: 'Acquisition' had a lasting effect. The Ferengi didn't show up for more than 200 years." A few words don't determine the course of the history of a whole civilization for 200 years. Archer's line, just like the conspicuous avoidance of the name "Ferengi", is nothing but an attempt to justify retroactively that the episode with its problematic continuity was made in the first place. "The first contact between humanity and the Klingon Empire was in 2218." No one can really tell where this information comes from. The Star Trek Encyclopedia states that the year was 2218, based on a line by McCoy in TOS: "Day of the Dove". The doctor allegedly mentioned the duration of human-Klingon hostilities which was interpreted hereafter as the time since the first contact. But in reality he didn't say anything implying a time. The only coarse date ever given for the first encounter of humans and Klingons was in the TNG episode "First Contact" where it was said to have been "centuries ago". In this light it is absolutely realistic that this event took place in 2151, as shown in ENT: "Broken Bow". "In the 2260s many Klingons were surgically altered to deal with humans or to infiltrate the Federation." "There are two distinct Klingon languages, Klingonese/Klingonaase and tlhIngan Hol." In canon Star Trek, a rudimentary set of phrases devised by James Doohan for "Star Trek: The Motion Picture" was developed into a fully-fledged Klingon language by Marc Okrand for TNG. Both were always treated as being identical. The language was simply called "Klingon (language)" on screen, "Klingonese" on rare occasions and initially "Klingonee" (at least that's what it sounds like) in TOS: "The Trouble with Tribbles" before anyone actually spoke any Klingon words. "Klingonese" should not be confused with "Klingonaase", which is a fragmentary non-canon language devised by John M. Ford for his novel The Final Reflection, later also in FASA games and in Star Fleet Battles. The name "tlhIngan Hol" for the canon language supposedly never made it to the screen either. "Star Trek Discovery is set in the Abramsverse (or, more precisely, in the past of what will be known as the Kelvin Timeline)." The producers and writers repeatedly confirmed that Star Trek Discovery is set in the Prime Universe, in the same universe as TOS. It is clear that, despite this intent, many facts and most visuals of the new series don't fit at all with the established canon. Some fans seek the solution to the dilemma behind the scenes, rather than in-universe. Most notably, there is a persistent rumor, allegedly coming from a "CBS insider", that Star Trek Discovery is produced under an "alternate license", the same license that also applies to the Abrams movies by Paramount and Bad Robot. The rumor further gained momentum by the statement of a production designer, who said he was told to make all designs for the series "25% different" for legal reasons. Any further proof, however, is missing. There is no second source that would confirm the claims of the "CBS insider" or that would link it to the purported "25% rule". It is well possible that CBS officials or lawyers told the production people things that were not meant for the public. The "25% rule" may indeed have existed as some sort of internal guideline. But as much as many fans dislike Discovery and would like to move it to a universe in which it doesn't harm TOS and the rest of classic Star Trek, the idea that CBS would continue to lie about the setting of the series is absurd. An in-universe fact check further disproves the rumor. Visual effects, such as the phaser beams or the warp effect, may be similar in the two universes. But they generally have to be ascribed to artistic license. The starships of Discovery may have the bridge windows and the huge sizes in common with those of the Abramsverse, but nothing else. The uniforms, the Starfleet emblems and many other details are different in the two universes in the year 2257. The redesign of the Klingons in Discovery further sets the two series apart, but that is rather a problem of Discovery's "visual reboot" concept, also and especially with regard to classic (pre-Abrams) Star Trek. Ultimately, the appearance of the TOS Enterprise (at least, of a ship that looks similar to the TOS Enterprise on the outside) in Discovery makes it increasingly unlikely that Pike and Spock will become the characters of "Star Trek (2009)" and will return to Earth to launch a new Enterprise in a couple of months (2258). We may still come to the conclusion that Discovery is not set in the Prime Universe, but there is neither confirmed real-world evidence that it specifically belongs to the Abramsverse, nor would this become apparent in-universe aside from random details. "V'ger was the origin of the Borg." It's a nice theory considering that Decker merged with the mechanical entity V'ger in "Star Trek: The Motion Picture". However, it was refuted as early as in TNG: "Q Who" when Guinan said about them: "They're made up of organic and artificial life, which has been developing for thousands of centuries." In a couple of Voyager episodes, for instance VOY: "The Omega Directive" and "Dark Frontier", it is implied likewise that the Borg have been around for thousands of years. 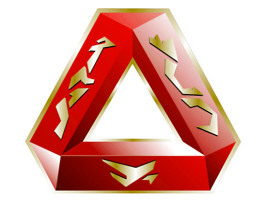 "The Tholian emblem is a red hollow triangle." The triangular Tholian emblem is depicted in the Star Trek Star Charts by Geoffrey Mandel. It originates in the short-lived science fiction series "Space: Above and Beyond", where it represented the Chigs. The explanation how the emblem found its way into the Trek reference book is simple: Geoffrey Mandel worked as a graphics artist for that series. This is also why we can safely assume that the emblem never showed up in a canon Trek production. The Tholian emblem is a one-time exception in the Star Trek Star Charts. 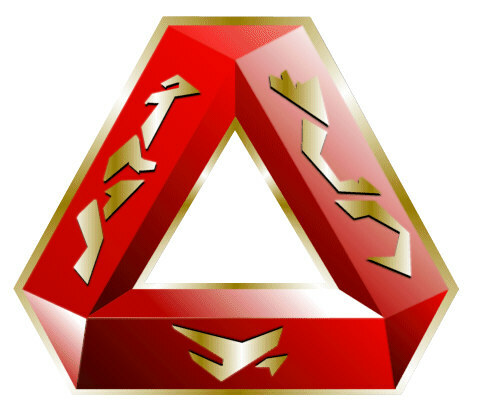 Several other obscure emblems can be found in the book, but could all be identified as canon. "The hadrosaurs survived the mass extinction 65 million years ago on a lost continent. Eventually they grew into an advanced society and left for the stars, losing track of their homeworld along the way." Chakotay suggested this in VOY: "Distant Origin" without providing any proof. It is nothing more than a theory, and not a particularly good one. The first problem is that it would be highly unlikely for hadrosaurs to survive the extinction. Secondly, it's hard to believe such an advanced species would limit itself to a single "lost continent" instead of occupying the entire Earth. And that this society would leave no satellites or solar system colonies or ruins anywhere to acknowledge their existence. Third, why would they leave their homeworld so far behind and choose a completely nomadic lifestyle, so much so that they forgot where they came from? Fourth, a large continent could not just sink out of existence, some trace of it would be found. Fifth, how would their civilization affect the growth of mammalian species after the dinosaurs died out? An alternative and more likely idea would be that an alien species such as the Preservers came along and, recognizing the hadrosaurs' ability to evolve into a sentient intelligent species, saved many members of the species from the great extinction and relocated them on a planet in the Delta Quadrant that would give them the best possible chance for survival with safe environmental conditions and protection from outside influence or attack. "Three-nacelled Starfleet ships are dreadnoughts, one-nacelled ships are destroyers." These notions, as common as they may be, are just fanon. We can regard the depiction of the three-nacelled "dreadnought" in the Star Trek Technical Manual as canonical because it briefly appeared in "Star Trek: The Wrath of Khan". But the illegible designation "dreadnought" is still non-canon. And even if we accept it this one example is still anything but a proof that all dreadnoughts (if there are any more besides the Federation class) have three nacelles, or that all three-nacelled ships are dreadnoughts. The same arguments apply to the single-nacelled alleged "destroyers". "The Klingon Bird-of-Prey is an originally Romulan design." The origin of this common notion is background information on "Star Trek III" according to which Commander Kruge was supposed to steal this ship from the Romulans. Hence the name which was originally meant to be a homage to the Romulan BoP in TOS: "Balance of Terror". But in the actual movie there is no mention of the Romulans. And the 22nd century Klingon BoP known since ENT: "The Expanse" is the ultimate proof that there is no Romulan connection whatsoever. "Romulan ships were limited to sublight propulsion until they acquired warp drive during a brief alliance with the Klingons in 2268, while the Klingons got Romulan BoPs and cloaking." Firstly, there is no evidence that the ship in "Balance of Terror" or even all Romulan ships until then didn't have warp drive. The myth came to life because of a line in TOS: "Balance of Terror" about the Romulans having "simple impulse" although this statement by Scotty could be easily interpreted differently. But as a consequence, the Star Trek Chronology explicitly states that Romulan ships during the Earth-Romulan War had impulse propulsion only, seemingly corroborated by a depiction of a primitive-looking Romulan ship of that time which is completely non-canon though. In "Star Trek: Insurrection" it was attempted to carry the error into canon Trek with a mention of warp drive that "helped to form a bunch of Romulan thugs into an empire... a century ago". However, a thorough analysis of the topic of Warp Drive and Romulan History shows countless lines of reasoning against this notion, and at last ENT: "Minefield" unmistakably shows old Romulan ships with warp drive. We do not have any solid evidence that there was a brief alliance between the Romulans and the Klingons, which must have existed since at latest 2268 and likely until the battle at Klach D'kel Brakt in 2270. The line from TOS: "The Enterprise Incident" intended to clarify why the Romulans had originally Klingon D7 cruisers was just "They are using Klingon design", not really implying how the Romulans got their hands on the starships. The Klingon Bird-of-Prey is a Klingon design and always was. ENT: "Expanse" gives us the ultimate proof because the Klingon starships resemble the later Klingon BoPs so closely that it would be a hair-raising theory to claim that the first is Klingon, whereas latter would be acquired from the Romulans more than a century later. "The Narada is so powerful because Nero outfitted it with Borg technology, as seen in Countdown." Until further notice the Star Trek: Countdown comic series is to be rated as non-canon, and this likely won't change. In an interview with Trekmovie.com, dated 9 December 2008, Bob Orci said that he personally considered some novels canon, but that it is not up to him to declare Countdown canon. In a later Q&A session, dated May 22, 2009, he explained the inconsistencies between the movie "Star Trek (2009)" and Countdown with the comic being non-canon. The same applies to the Star Trek: Nero comics and the whole story about Nero's imprisonment on Rura Penthe. "The Excelsior transwarp experiment was a failure." 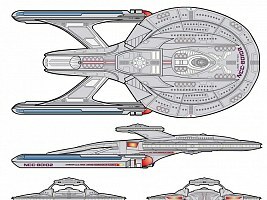 Although explicitly stated in the TNGTM, the Excelsior's transwarp was neither said to be a failure in "Star Trek: The Undiscovered Country" or in any later episode, nor do we know for sure that the ship didn't still have transwarp drive when Sulu began his mission in the Beta Quadrant in 2290. Actually, an equally valid assumption would be that what used to be "transwarp drive" on the original Excelsior (which may have nothing to do with Borg transwarp) was called just "warp drive" in the 24th century. "The Sovereign class has Type-12 phasers." The type of phasers of the Enterprise-E has never been mentioned on screen, much less that they would be two steps more powerful than on the Galaxy class. Yet, the idea is corroborated by an entry about the ship's weapons in Star Trek: The Magazine, October 2001, page 42: "The phaser arrays installed on the Enterprise are Type XII and have a power output of 7.2 megawatts." 7.2 megawatts doesn't sound like the most powerful phasers available, though. "Riker's command, the Titan, is a Luna-class vessel. It is a canon design." The Luna-class gained widespread recognition because a competition was held to decide about the design of the ship for the Star Trek Titan book series. The winner was Sean Tourangeau. However, all novels and all of their contents are non-canon, irrespective of their popularity. "There are ships named 'City of New Orleans' and 'Royal Sovereign'." In the early 2000's, some fans keep used to defend these misconceptions with a passion although there is absolutely no canon ground for the two long names. The notion that it should be "City of New Orleans" instead of "New Orleans" is nothing more than the consequence of an awkward pun in the Star Trek Encyclopedia. The entry mentions in a side note that the class is "named for the ship they call the City of New Orleans", alluding to a line in the song "City of New Orleans" by Arlo Guthrie. "Royal Sovereign" instead of "Sovereign" is preferred by some fans because it sounds more historically correct to them (because there was an HMS Royal Sovereign) or just because they have become accustomed to the FASA design of the same name. "The Sydney class is an early runabout, a warp-capable variant of the executive shuttle." This is a misconception, considering that the Sydney-class design is many times bigger than a runabout or the said executive shuttle. The blunder was perpetuated by official publications like the Star Trek Encyclopedia and the Star Trek Fact Files merely because the studio model of the Jenolan for TNG: "Relics" was built using parts of the shuttle, but with the bridge module, windows and nacelles clearly indicating that it is a big starship. "NCC" stands for 'Naval Construction Contract.'" This is one of the most prominent examples of fanon. But nothing ever mentioned or shown on screen would support this interpretation. Perhaps we should accept that it's just three letters. 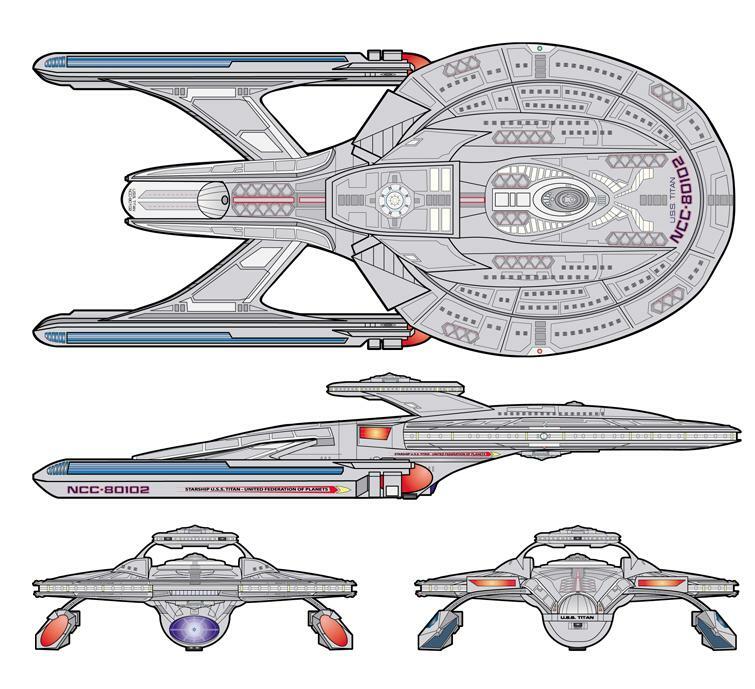 "Enterprise NX-01 is the first ship of its class, so it is the Enterprise class. The NX registry denotes that it is a prototype ship." This is wrong on both accounts. Captain Archer explicitly states that his ship is of the NX class in ENT: "Fortunate Son", with several more mentions of the class name still to follow. This already refutes both claims: If NX is the class name, then "NX" in the registry clearly does not stand for "experimental" in the same fashion as in the 23rd and 24th century. In addition, we know of two other ship classes of the 22nd century that are identified by letters instead of real names, the J class and the Y class. It is possible that, regardless of the retirement of Enterprise NX-01 as indicated in ENT: "These Are The Voyages", the naming and numbering scheme may have changed very soon after the foundation of the Federation. The NX class might have been renamed "Enterprise class" (although this honor should go to the USS Enterprise after the refit, as seen in "Star Trek II"). The new registry system, with "NX" now meaning "experimental" might have been inspired by the NX-class numbering scheme. But irrespective of any personal stances on the NX-01-A riddle, at the time Enterprise NX-01 was in service there was neither an "Enterprise class" nor an "experimental ship registry". Thanks to all the people at the SCN who have joined the discussion, particularly to Patrick Carroll for bringing up the false canon issue and for his suggestions about the female captains, the Voth and other things. Special thanks to Patrick Kovacs for pointing out that "Marines" used to exist behind the scenes and that there is no fixed date for the human-Klingon first contact and to Cameron Leatham for the quote about the origin of the Borg. The information about the name "Rihannsu" comes from Christopher Mace. The mention of Type-12 phasers was found by Matt.